Occasionally, Get Rich Slowly will feature reviews that alert you to new product offerings in which you may be interested. While we haven't covered a specific credit card offer in a while, this afternoon we're alerting you to an offer by Slate® from Chase because you can save with a $0 introductory balance transfer fee, a 0% introductory APR for 15 months on purchases and balance transfers, and a $0 annual fee. The Slate® from Chase is one of the first cards we've seen heavily promoted in a long time that allows you to transfer higher-rate balances with a $0 introductory balance transfer fee. Specifically, with the Slate® from Chase card, there is a $0 introductory fee on transfers made within 60 days of account-opening. If you transfer a balance after the first 60 days, the ongoing balance transfer fee is either $5 or 5% of the amount of each transfer, whichever is greater. For a long period of time, fees have been assessed on balance transfers such that you incur an expense when you transfer your debt to a new credit card (often right at, or right after, the time you applied for the card). These fees are usually expressed as a percentage of the balance transferred, and today the typical balance transfer fee ranges from 3% to 5%. So for example, the drawback with many cards is that, if you decided to transfer $5,000 from a high-interest credit card to take advantage of a promotional 0% interest rate (e.g., 0% for 18 months), you could end up paying as much as $250 right from the get-go. We think that $250 is a lot of money to pay to “start saving money,” as it were. Before we go any further, let's be clear: The best way to get rid of your credit card debt is to simply pay it down. Period. If having credit cards is what got you into debt in the first place, then you should not be applying for this or any other credit card. You should take the following advice from our post on how to get out of debt: “Stop using credit. Don't finance anything. Cut up your credit cards.” You won't help your debt situation if you keep adding to it. However, if you are unable to pay the debt immediately AND you can refrain from adding to your debt, it's possible that the Slate® card from Chase could help since it has a $0 annual fee and an introductory APR of 0% for 15 months on purchases and balance transfers. This could give you some breathing room to pay off your balance — if you make sure to pay it off before the 15-month period ends. Otherwise, you'll find yourself back in the same situation as before (or worse if you have accrued additional debt). Note: This card is only for those who have good or excellent credit. If you don't think you qualify, you shouldn't apply as some believe applying for a credit card may affect your credit score negatively and you most likely won't have the credit card in the end anyway. If you are looking for a balance transfer credit card, it's worth the time to investigate other credit card offers. There may be other credit card offers like Slate® from Chase that have a $0 balance transfer fee on balances transferred. We don't currently know of any right now; so if there are, please mention them in the comments. There are numerous stories of people who found themselves in over their heads with credit card debt (many of them by personal finance bloggers such as J.D. himself), but it is possible — and even advantageous sometimes — to use a credit card without going into debt. Have you been successful using a balance transfer credit card to get out debt? Have you tried to use a balance transfer card to manage your debt, only to make the situation worse? Share your thoughts below. There are 41 reader responses to "No balance transfer fee credit card: Slate® from Chase". Did the rich/poor discussion need to be bumped down? This article… I mean this infomercial could have waited until tomorrow. I found this referral quite helpful (and the article was tasteful at that). I am passing this information onto some family members who are getting out of debt, have good credit scores and some credit card balances with super high interest rates. The information in this article might just help them save hundreds, if not thousands of dollars in interest (some of their accounts have like 27% APR). Nate, will all due respect, the best advice to give them is not to apply for another credit card, but to tell them to pay off the smallest balance first, then the next smallest, then the next, until all are paid off. Giving them this info is like telling an alcoholic when Happy Hour is at the local pub. I say this because I had credit card debt problems. To the tune of 30K. Paid it off in 4 years. Haven’t used a card in that long. Actually going on almost 6 years. Paid it off a year ago last month. Do them a favor. Cheers. Hey Mark! I appreciate your debt snowball reminder. I to understand the motivational power and sense of accomplishment that comes from paying of debt smallest to largest; it’s a pretty awesome phenomenon! I had over $50K in small consumer debts and student loans — paid them off in just shy of 2 years. The family members I am talking about have actually been following the debt snowball and have already paid off about 15K so far. They have something like 30K remaining; and these lines of credit are at high interest rates (all around 20% APR or more). Their monthly payments are ludicrous. Because of their demonstrated commitment to paying off these debts I am helping them explore the potentially enormous savings that will come from transferring the high interest rate accounts to a lower interest rate environment (or in this case, if it works out, a 0% rate). I respect your opinion Mark; I am actually a huge proponent of the debt snowball method. However, why would they take about 4 years to pay off debts that could be cleared in just about 2 years if they stick to their payoff plan (only with a lower interest rate on the debt service)? For the majority of people who come to me for financial advice I suggest just as you say. However, there is no one size fits all (sorry fellow Dave Ramey fans!). Do what works best for you and your family. Mark, I think you make an excellent point. A person carrying around a balance probably has financial issues. Like you imply, one can’t make the drunk sober by giving him another drink! But then again, it really might be a short term benefit to someone who is solvent yet not wishing to crimp their cash position in order to make an important purchase. 12 months free money is nothing to scoff at if you’re responsible (which I think most of us around here are, otherwise we wouldn’t be here). It’s also a fact that many people can use debt/cards responsibly to give them an extra financial edge. Just because guys like Dave Ramsey tell us debt is evil doesn’t make it so. I mean, we all can’t get rich selling financial salvation. Some of us have to hustle a little harder than that to make ends meet. Along these lines, Chase cards are simply phenomenal. The travel awards they’re handing out are crazy. On the other hand, I also just transferred my Chase Southwest Airline Card points into $800 in Walmart gift cards. That’s many months worth of detergent, fabric softener, diapers, and toilet paper. That’s real money in my pocket for just a couple hours work. That’s in addition to the $7000 in travel vouchers I’ve loaded up on in just a few short months. Family trip to DC to visit museums? Hotel paid. Family trip to Florida next year? Airfare and hotel covered. Family trip to beach resort in Caribbean? Air and hotel half paid (should have it all covered in 3 more months). Bottom line, if you have sterling credit, carry no balances, pay your bills in a timely fashion, and travel a decent amount, the CC travel reward game is the only CC game in town really worth playing. It’s not a bad card offhand, but did you get paid for this post? I personally don’t mind the occasional sponsored post as long as it’s marked as such in the title. Ah, if this offer had come a few months back, I would’ve used this instead. Chase offered a 0% balance transfer for a 1% fee a few months back, and I decided to use it to pay down a portion of my student loans (6-7% interest rate) using the balance transfer. E) The tax deduction will probably net me about the same amount, but it gave me a psychological boost to see my student loan balance decrease a good amount. And I don’t want to pay them any more interest than I have to. F) I had my credit limit increased to make sure the balance transfer didn’t put me over the maximum recommended credit utilization. Even if it dinged my credit a little bit (I don’t know if it has, I’m just guessing), overall the benefits outweighed the costs for me. I have the Chase Sapphire card and even though there is a lot going against the big banks right now, I have been very pleased with my Chase card. The old ploy was to grab $10,000 or whatever through these zero percent no fee offers (they used to come with convenience checks too) and then invest it in a CD or something paying 2%. It was free money even if they charged a minimum balance transfer fee of $10 or something. I think one time I hit them for $40,000 or something like that. That ploy was destroyed with the institution of minimum balance transfer fees. Maybe this will come back but with no way to earn any meaningful return on a CD, etc. right now, the ploy would be pointless. I see that this article is written by “GRS reviews.” It means a lot to me to know the author(s) of a piece; I think it helps readers to evaluate the content, put it in the appropriate perspective, and also to hold the author(s) accountable. I recommend that all GRS articles have a name in the byline. It could even be a pseudonym, as long as that handle belongs to one and only one person. Thanks as always for the useful articles and storytelling. Looks like a couple of cats got away. I didn’t mean to be deliberately incognito, but while JD is traveling (Bolivia or Lima now, I believe), this offer came out. And I thought it was a good offer to mention so I put it out there using a byline that already existed in WordPress rather than create a new one for myself. I agree that a dedicated byline is a good suggestion. Also, I didn’t mean to stifle discussion by knocking the Rich / Poor post down and if JD was here, I know he would have done it differently. Jamie? Jamie Dimon? Is that you?! Thanks for the response and for claiming authorship! Those were the good old days. Did that myself a couple of times. It was a nice way to make and extra couple of hundred dollars a year. I’m not fond of things like this, and I generally find it to be the beginning of the end when it comes to things I value. A couple things I would like to know. Who wrote this? Why did they write it? Is this going to be something we see more of? Hey, all. As most of you know, I am still in Peru. I had no hand in this article. I haven’t had a hand in most of the articles over the past month. As Get Rich Slowly grows, it’s moving beyond just being about me and my finances, as has been clear for the past couple of years. All of this is to say that the some of the GRS elves decided this was newsworthy and ran with it. I e-mailed to get more info, and here’s what I found out: There’s no specific disclaimer on this post because GRS wasn’t asked to post it or paid to post it. (There’s never yet been a “paid post” at GRS.) That said, as with all posts here, any affiliate links do generate revenue for the site. That’s clearly stated in the disclaimer in the sidebar, and I’ve said it many times in the past. It’s nothing new. Finally, two posts on credit card offers in a year is hardly a habit. I posted in April about a card my friends told me about (and which I now have), and this is the second card we’ve mentioned. Before that, I think you have to go back to 2008 or 2009 to find a post about credit cards. We’re talking about $240 in cheddar. Not nothing. Thanks for replying, J.D. I don’t think anyone here minds if GRS uses affiliate links to make a couple of bucks, but such a sticky issue as credit cards deserves full disclosure up front, even if it’s not a sponsored post. I know from experience that some credit cards can offer large affiliate specials, which makes it really tempting to link to them. I also know you feel you didn’t do anything wrong, but I’d point to Netflix and Bank of America who recently alienated their base by demanding what they were doing was ethical. Both companies finally retreated after a lot of harm was done. If the readers don’t want credit card affiliate posts, you might have to avoid them. Why so cynical? Actually, that’s a good thing, but, you know, you take it a bit too far. You can always skip reading a post. I WANT credit card posts now and then, and I’m a regular GRS reader, so keep them coming … every few months. Understanding the good and the bad of credit cards and the marketing ploys of their providers is a benefit to readers. Longtime readers should realize any conflicts of interest are extremely minor here. This has got to be one of the most objective blogs I read regularly. Look back at this post. Do you really believe the author had anything else in mind other than to present a money tool option that possibly could help responsible readers? It’s like you’re looking for something to pick at. I guess the wool clothes post by JD awhile back was just a blatant advertisement for Icebreaker. For me, it was useful information and a starting point for more research. Be careful of Chase raising the minimum payment from 2% to 5% as they have done for many people – http://blogs.wsj.com/wallet/2009/07/01/deja-vu-chase-raises-minimum-payments-again/. Although the interest for this offer is fixed, Chase can set the minimum payment as high as they’d like without giving you the opportunity to opt out. I know Citi keeps mailing me 0% balance transfer offers, but I use Citi Forward which is a student credit card. I would recommend paying down the debt and getting a new rewards credit card which usually comes with 0% interest for the first few months. This is all assuming the credit card holder uses the card like cash and manages it properly, otherwsie, a credit card is probably not a good idea. I appreciate getting a heads up on good offers. I’ve had great experience using balance transfers, albeit in the days before balance transfer fees. I did the equivalency of my masters program (vocational training) at a school that I couldn’t get any financial aid through. I wrote checks to myself on 0% balance transfer options and was able to finance my education. I juggled 0%–3% transfers for a few years until I was able to get it all paid off and now have a successful career. Worked for me. Horrible “article,” of course. Also EXTREMELY IRRESPONSIBLE not to mention that the BALANCE TRANSFER IS ONLY FOR 12 MONTHS! You need to include that information in your ad. What a funny comment, Ann. Did you read the part where it says “it has no annual fee and a promotional 0% interest rate on purchases and balance transfers for 12 months…just make sure you pay it off before the promotional period ends, otherwise you’ll find yourself back in the same situation as before (or worse if you have accrued additional debt)”? I’m not sure why this is a controversial post. I found it useful, and appreciate being informed of it. Plenty of other blogs mention credit cards much more, and are more blatant about it without all the disclaimers in this post. I guess I don’t care if this was a “sponsored” post or not. It’s a commercial. I don’t come to GRS for commercials, and CERTAINLY not for credit cards. If you’ve had a great experience using a card for a few years and want to share that with readers, JD, please do! But “alerting us to deals” seems compeletely out of place on this blog. Plus, the “GRS Reviews” byline was creepily anonymous. I don’t know why this was a article. Are we really going to say that debt is good? Debt generally isn’t good, but managing it to your best benefit is. Thanks again for the post. What is with the attitude of the anti-credit card users and the constant preaching about how they are evil? If YOU can’t handle it, then don’t get a credit card. But for those on the path to recovery, especially for those who will finish in the next few months, this can save a lot of money. Credit cards are all about psychology. They are a powerful tool in the path to getting rich slowly. But they can also bury you even faster if you succumb to your desires and act irresponsibly. I can’t keep Oreos in the house. I get my cookies on the outside. If credit cards are your Oreos, stay away from them. 0% balance transfer credit cards, especially one offered today with no fee, are a great tool to stop the bleeding of interest while you regroup. Man, I love Oreos. I just want to throw my hat in the “I liked this post” ring, because this was actually really useful for me and I’d really hate it if GRS would stop alerting us to stuff like this just because other people didn’t approve. But, it would be nice to know how this card stacks up among the pack, and it seems like this post is really only about the terms of this one card. For example, were other cards investigated to see how well they stacked up?How did they differ, and how well did they fare on a number of points? Otherwise I think there is a rich history of explaining and highlighting specific financial products here, like Mint or the microloan sites, etc. PF is not something we do in philosophic terms, or in abstraction. If you’re really committed to getting out of debt and are able to resist using credit cards when they’re available to you, this can be extremely helpful to someone paying high interest on their existing debts. Several months ago, I got this card and then received a similar offer from Chase for a no-interest rewards card. These two cards have helped me make a lot of progress in paying off the last of my credit card debt without struggling against the extremely high interest I had been paying, which made it feel like I was getting nowhere. I’ve been hoping GRS would do a post on a good CC to replace the no-longer-2%-cash-rewarding Schwab Visa (boo hoo!) I’m in the market – need something with good rewards and no forex fees – I’ve seen good things on Capital One Venture – any thoughts on this or others? I’m perfectly happy with a CC post – and they make complete sense on GRS. I’m wishing I had jumped on that BA one now! A few years ago when I was getting out of debt, and before that, in it, I was using these 0% offers. In the end I used them to combine smaller higher interest balances. For some reason it makes it easier to sleep at night when you know you only have this one credit card debt to pay as opposed to 5 or 6 or 10? It’s how I was able to pay off $18K in 10 months on a $44K salary pretax. I did use a 0% promotion at Home Depot to put wood floors in my house but couldn’t stand the balance and I paid it off in 4 months instead of the 12. After living 11 years in constant credit and car debt I will put everything on hold to make sure a debt is paid. Credit cards rob us of future income because we have to pay for past behavior. 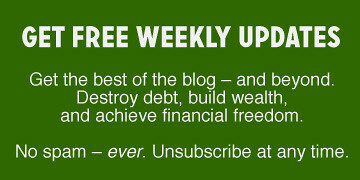 Those who wisely use this great offer to get out of debt faster once and for all will win. Those who put off paying a debt because it’s not accruing interest will not learn anything and will probably accrue more debt. Ugh. In February or March I got a balance transfer card at a much lower interest rate than any of my other cards, paid the other three cards off… left my job in April and had doubled by debt by maxing out those higher-interest cards by early June. NOT my finest hour. This is an affiliate link. Get Rich Slowly makes money when you apply for this card. It should have been noted in the article. It’s tacky.